Actually it’s likely just cracking it because Baseball Riot is Tennis in the Face. Just with a different sport and a different protagonist. The evil fizzy drink Explodz is still the evil evil thing, too. So, think of Baseball Riot as Tennis in the Face 2 and all will be cool. If you haven’t had the pleasure, TitF was a physics-wrangling puzzler where you bashed fuzzy balls at various enemy types, the aim being to clear certain goals in each increasingly tricky level. 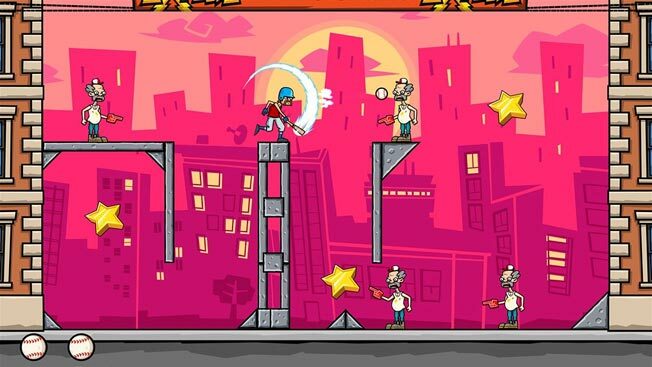 Meanwhile, Baseball Riot is a physics-wrangling puzzler where you bash hard balls at various enemy types, the aim being to clear certain goals in each increasingly tricky level. Just like various avian entities which may or may not be aggrieved, it is a game of skill. Get the angle exactly right and you can pull off incredible carnage combos – and give yourself a well-deserved pat on the head. Mess it up and you’ll likely get messed up – at least in-game. What punishment you may ascribe to yourself when you get all faily is entirely up to you. There are some 100+ levels, many of which will drive you utterly mad at various times, plus a few side projects and several goals to attain should you be the trophy-hunting type. At an admirable pocket money price, if puzzles of a Newtonian nature be your thing then Baseball Riot hits a home run.